I awkwardly asked the workers what had happened, gazed sadly at my rug, then subtly closed my blinds and planned what I was going to say to the housing office about my ruined rug. Anywho.. crisis adverted. I've washed it twice now and the mud as well as the plastic-y smell is gone. This has been without a doubt the most difficult rug I've ever owned. 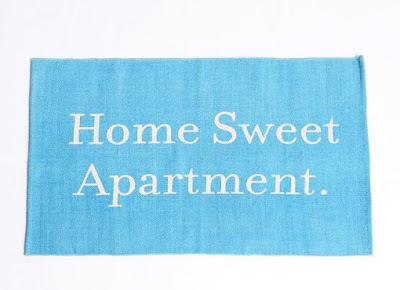 Love your cute rug! Glad you got it clean. That sounds like something that would happen to me. Sounds like you are making progress with your goodie bags. Love & blessings from NC! aww...I'm glad you were able to get it cleaned. So cute! Cute rug and well worth all the headaches! You are the best. Wish you were here this weekend. Miss you!